A jilted Halo fan did the only thing he could after the woman he loved dumped him: he sold her engagement ring on eBay and used the money buy a full suit of Master Chief armor. Eric Smith was a man in love. And like every man in love, he wanted only to please his woman. So when it came time to buy her an engagement ring, it had to be special: white gold, with a canary yellow diamond, just as she said she wanted. But then it all went wrong. She met someone else. She fell in love. And poor Eric, ring in his pocket, was left a crushed and broken man. The ring sat for months, untouched. Finally, unable to sell it locally, he disposed of it on eBay. But even though the ring was gone, the money in his PayPal account was just another reminder of his loss. Something had to be done. And so something was done. Smith blew it all on "40 pounds of fiberglass and steel, dark green, built by an artist outside Detroit, [and a] helmet, with glimmering golden visor and bright LED lights, imported from a legendary Stormtrooper armor-builder in the Philippines." A full suit of Master Chief armor. It's not the most convenient outfit he owns. Smith said it's hot and uncomfortable, it takes two people to help him put it on and he has to walk very slowly when he's wearing it at conventions so he doesn't tip over and break the suit or himself. But he says he loves it. He also says that despite the circumstances, buying the armor wasn't a spur-of-the-moment decision. 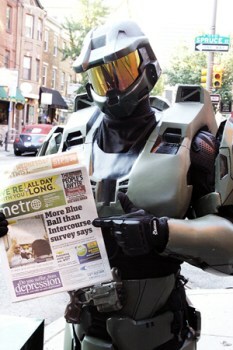 "The Halo armor was a long time coming. For years, I'd mused over the idea, driving my closest friends mad," he wrote. "'One day when I have the money,' I'd say, thinking about that canary yellow diamond. 'I have to be responsible right now'." And while he says that the most obvious "psychological diagnoses" about a broken-hearted man covering himself in armor are off-base, he did admit that the suit helped him work through his grief. "I'd wanted the suit for so long, and after such epic heartbreak, receiving each piece of armor - arriving in seven shipments, over the course of eight months - became an unintentionally cathartic process," he said. "As the shoulders, forearms, chest-piece, and helmet arrived slowly, one section at a time... well, with each part I got a small piece of myself back." And I say to you, Mr. Smith, well done, sir. Well done indeed.